Ovarian cancer is the fifth most common cancer affecting women in England and Wales. Most women are diagnosed at a late stage in the disease, which means that it may not be possible to cure it. Treatment usually involves a combination of surgery and chemotherapy for most women. Surgery (primary surgery) first followed by chemotherapy. Standard surgery (sometimes called radical surgery) for ovarian cancer usually involves removal of the ovaries and fallopian tubes along with the womb and the omentum (fatty apron covering the organs inside your tummy). The lymph glands may also be removed if they are found to be enlarged on your CT scan. 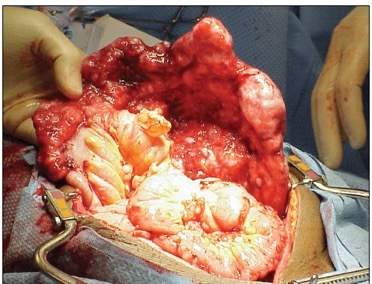 If you have bowel removed during the operation, you may have a stoma (an opening on the tummy wall for waste to pass). This may be temporary or permanent. During your treatment, you will be looked after by a team of health care professionals who specialise in caring for women with gynaecological cancer. This will include Mr Chattopadhyay (gynaecological oncology surgeon), medical oncologists, radiologists, and clinical nurse specialists (CNS). Mr Chattopadhyay will discuss the procedure that has been recommended for you in detail and explain how it will affect you. Once you are satisfied with the explanation and have had all your questions answered, you will be asked to sign a consent form for the operation. You will also be asked for permission to collect details of your operation to record and review what happens to women who have this operation. You may be asked to complete a quality of life questionnaire before and after treatment. The benefits of the operation depend on whether the surgeon is able to remove all visible cancer tissue. The aim of the operation will be to remove all visible cancer in order to reduce the chances of the cancer coming back. All treatments carry risks as well as benefits. Your health care team will discuss the alternative option which is chemotherapy alone. The risks and benefits of this approach will be discussed with you. Your wishes will be respected if you do not wish to have any treatment. If you do not have any treatment, the cancer will progress and your health will deteriorate. At this time, you may wish us to transfer your care to the Palliative Care team. They will discuss what will happen next and help you to manage your symptoms. This can be done at home, in the hospital or at your local hospice. NICE (National Institute of Health and Care Excellence) has said that removing all visible cancerous tissue offers the best chance of improving survival. However, this is a risky procedure which may make women more ill. The possible survival benefit has to be weighed against the risks of the procedure. Internal bleeding can sometimes occur after the operation and may need a second operation to control it. An internal infection may occur. Treatment with antibiotics through a drip is usually necessary. Occasionally a second operation may be required. Blood clots in the legs or pelvis (deep vein thrombosis or DVT). This may result in a blood clot in your lungs (pulmonary embolism or PE). You will be given special stockings (TED stockings) to wear after the operation to prevent these clots. You will also be given injections to thin down your blood and reduce your risk of forming clots for 4 weeks after the operation. You will be encouraged to move about as soon as you are able to after the operation. Injury to major blood vessels, bowel, urinary tract (bladder and the tubes that carry urine to the bladder) and nerves can occur during the operation. Your bladder and bowel may take some time to work after the operation. There are significantly more serious complications than standard surgery. The risk of death is approximately 1%. If you are happy to go ahead with the surgery, Mr Chattopadhyay will have a detailed discussion with you prior to you signing the consent form. You will be given a date for the procedure and a date for the pre-operative assessment clinic. You may need to be seen in the anaesthetic clinic if an opinion is needed from the anaesthetic team prior to surgery. You will be seen by the nursing team in the pre-assessment clinic who will talk to your about your general health, your previous medical history, and your medication. You will also have a number of routine tests (blood, heart and lung tests) during this visit. The colorectal stoma nursing team will also see you in the pre-assessment clinic. This does not mean that you will definitely have a stoma, but there is a small risk that you may need one. If you have any questions after you have left the clinic, you can contact the nurse specialists who will be able to help you. A physiotherapist will see you in clinic. The nurses will give you information about what happens during your stay in hospital and also discuss your plans for going home. You will be advised to make arrangements for family and/or friends to support you when you leave hospital. Your anaesthetic consultant will see you prior to your surgery and discuss the anaesthetic and pain relief with you. You will be admitted to hospital the day before the operation. It is likely that you will be given bowel preparation before the surgery. This is a drink to clear your bowel before surgery and will make you go to the toilet several times. Once you have the bowel preparation, you should drink fluids only. You may be started on fluids through a drip to stop you from getting dehydrated. You will be given special stockings to prevent the risk of blood clots in your leg. You will also be given injections every day to thin your blood. After the operation, you will be cared for in the recovery unit in theatre for monitoring. You will then be transferred to the ward. Occasionally, you may be transferred to the intensive therapy unit/high dependency unit (ITU/HDU) from recovery if you need to be monitored closely. Your stay in the ITU/HDU may vary between overnight to a few days. You will have a drip in your arm so that we can give you fluids and pain relief after the operation. This will be removed when you are able to eat and drink. You will have a tube in your bladder (catheter) to allow the urine to drain. This allows us to monitor how well your kidneys are working. This is usually removed after a period of 24 to 48 hours or when you are able to walk to the toilet to pass urine. Some women will have a tube in their tummy (drain). This is usually removed the day after the operation. Occasionally, there may be a tube in your nose (nasogastric tube or NG tube) to drain the fluid in your stomach and stop you from feeling sick. You will be able to talk and breathe while the tube is in. It will be removed once you are able to drink without being sick. Very rarely, some women may need to be given a feed through a drip in the neck or their elbow. This is called total parenteral nutrition (TPN). If you need this, you will be monitored everyday by the nutrition team. You will have stitches or staples on your skin which will be removed 10-14 days after surgery. Apart from being reviewed daily by your team, you will see a physiotherapist who will help you with breathing/coughing and movement exercises. If you have a stoma, you will be seen by the stoma nurses, who will teach you how to become independent with emptying and changing your bag. You will be independent and will be able to manage at home. Patients and relatives may have difficulty in coping with illness, the effects of treatment and the effects of surgery on self-image, and may benefit from counselling and psychological support. As part of your care, your team will be able to discuss any issues or concerns you may have as a result of surgery. Your GP will be informed of your discharge from hospital. A district nurse may be arranged to remove your staples at home. You will be seen in the outpatient clinic 2-4 weeks later with the results. At this time, you will also see the medical oncology team to discuss further chemotherapy treatment.